MUSIC is an art, the making of instruments a science. That may explain, in some measure, how Laurens Hammond has been able to invent the electric organ and the Novachord, even though he cannot play a piano. By inclination and training, the unmusical Mr. Hammond is an inventor. On his desk is a large binder full of patents that have been issued to him. The first one, dated 1912, is for a barometer he developed when he was but sixteen years old. 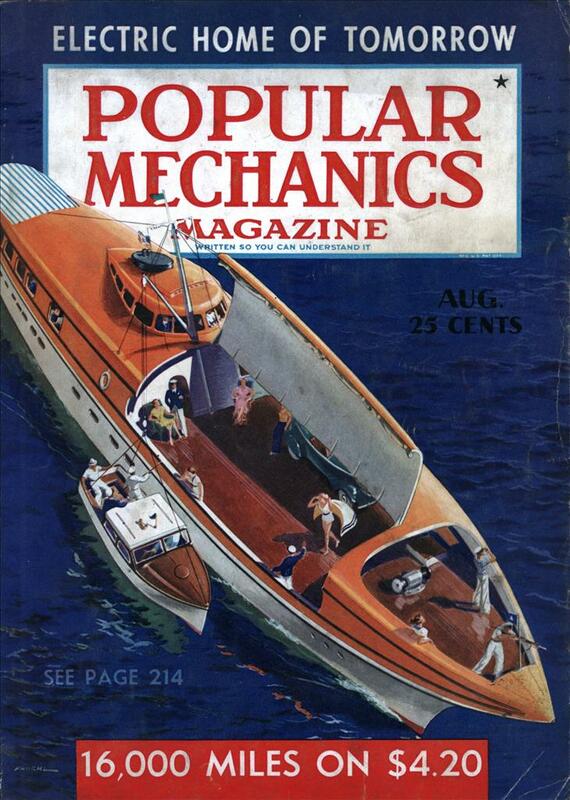 His earlier efforts were in connection with Diesel engines, three dimensional pictures, and novel stage-lighting effects, but the turning point in his career was his synchronous motor. He used it as the heart of the first electric clocks he made in a small room over a store building in Evanston, Ill., and almost overnight there was a national clamor for them. The shop mushroomed into a large plant. Hammond started looking around for other fields in which his delicate mechanism might be put to work. A combination clock and calendar was his first adaptation and this he followed with a synchronous phonograph motor, and finally the electric playing-card shuffler. 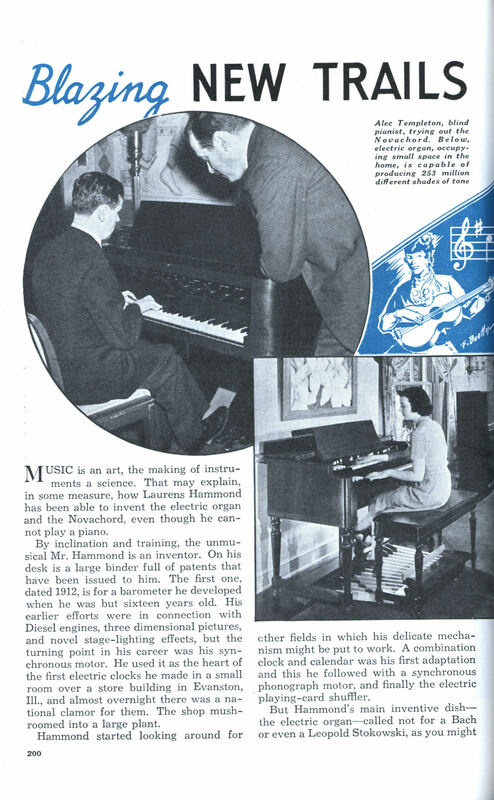 But Hammond’s main inventive dishâ€” the electric organâ€”called not for a Bach or even a Leopold Stokowski, as you might suppose, but an infinitely patient engineer with a thorough grounding in the laws of sound. Didn’t music depend on physics? If one tone could be produced with electrical impulses, as was the case with the dial signal on the automatic telephone, why couldn’t other tones of the scale? The inventor proceeded to work out a practicable way of producing, varying, and swelling sounds electrically. Ninety-one alternating-current generators of the electric-clock type, each operating at a different frequency, were rigged up to a synchronous motor. Thus, at the touch of a key, electrical vibrations would generate the sound, which could be amplified to any de- sired volume. The ninety-one tone wheels, Hammond found, were capable of producing approximately 253 million shades of tone. Musicians were impressed. Here was a new sound-producing agency, the first important one to come along in several thousand years. What was more, the sound source was vibrated in a manner never before attempted, a way that made possible the absolute control of the physical qualities of each tone. Composers and concert artists who normally sniff at scientific music applauded the electric organ. George Gershwin bought the first one, other musical headliners followed. For the price of a grand piano, churches unable to buy pipe organs found a substitute in this compact instrument that used about ten dollars worth of current a year and never got out of tune. Home organ music, once a luxury, began to be heard in small homes. Within a few months, more than 800 organs were sold. Two years ago Hammond, after seeing his electric organ carried to more than forty foreign countries, went to work on a second electric instrument, the Novachord, the successful development of which has given the musical world food for conversation and speculation the last few months. Contrary to popular belief, the talented offspring of the electric organ is not designed to imitate any regular instrument and according to Hammond, its full potentialities are not manifest in the familiar melodies now being played on it. But until music in line with its versatility is written for it, the instrument, which might be mistaken for an old-fashioned spinet at first glance, must remain a musical mimic. Played in the manner of a piano, it yields not only piano and harpsichord tones but simulates the effects of the violin, cello, French horn, Hawaiian steel guitar. But in place of pipes, reeds, strings, hammers or vibrating parts, it has circuits of ordinary vacuum tubes. From the viewpoint of an engineer, Hammond feels the development of musical instruments should lie in the direction of making them more flexible and versatile so that composers and musicians will have new tools permitting them greater freedom in the expression of their art. “An artist,” he points out, “who is going to paint a picture buys a canvas and a box of pure color paints. The canvas has no lines on it and he mixes every shade of color himself. What he paints is entirely his own doing. He would scorn any offer of mixed paints such as ‘flesh pink’ or ‘sunset red.’ The musician, on the other hand, has never been able to get musical instruments which have not been ‘voiced’ by the maker of the instrument. The builder in his shop has picked the ‘nice tone’ to put into the instrument, and the musician must be satisfied with it or by some other builder’s fine tone. This is simply the ‘flesh pink’ idea in a different form, and for this reason the composer has never enjoyed the freedom of the painter. Already composers, young writers with fresh vision, are seeking to combine the resources of the past with the new music materials engineering science is making possible.